Have you ever participated in a marathon? Or have you ever practiced for one? The only way you can finish a marathon is high stamina and a constant comfortable pace. 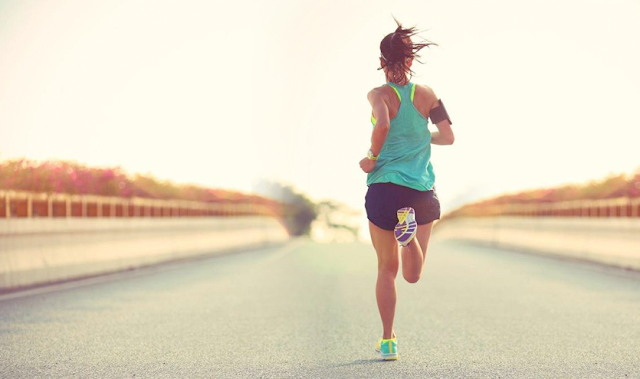 If you run too fast, the energy in your body will drain out quickly and you will get tired within first 10% of the run. But if you maintain your own comfortable speed, where you heart beat is not too high then you could finish the marathon without even getting too tired. The key is glycogen stored in the body. On an average a person can store up to 2000 calories of energy that is readily available and then once this glycogen is consumed body starts burning fats to get energy which leads to fatigue. The key in marathon is to consume this glycogen efficiently and so you have to run at a comfortable pace. Similar to this concept, in structural engineering, a building has to perform under large forces without breaking itself to pieces. As we discussed about different sources of energy dissipation (which you can find here), we understood how inelastic energy dissipation plays an important role in resisting earthquakes. (The term earthquake resistant structures should be used in place of earthquake proof ). 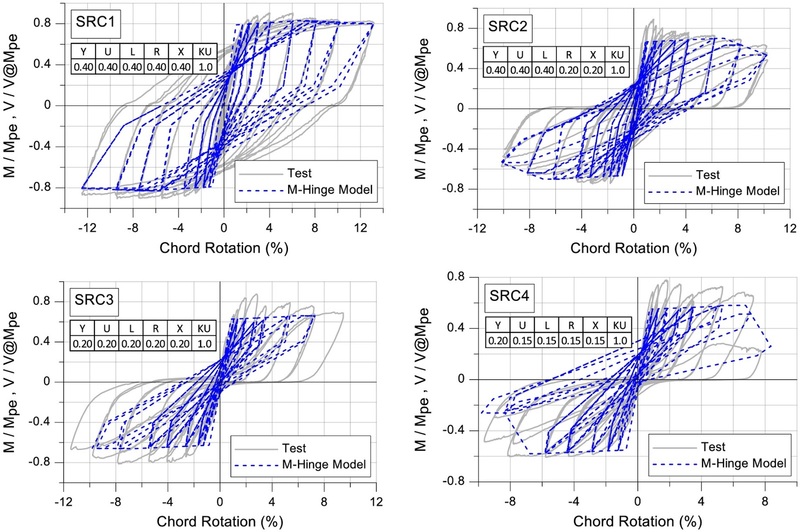 Inelasticity in materials generate large strains and large strains corresponds to larger deformations. Now how does a material look under large strains? Take a plastic bag and pull it as hard as you can. After a certain magnitude of force, the bag will stretch freely even if you don't increase the load. Thus you know that the material is already yielded and it has reached into its plastic state. Once you release the force, bag is not going back to its original shape but instead it will maintain its current deformed shape. This is called permanent deformation of the material. Similar to that if you take a mild steel rod and pull it under a universal testing machine, you will see that the steel rock necks down after a certain force, this is also a type of permanent deformation. Now before reading any further, if you have not then please do refer to our blog Ductility vs Elasticity and then continue reading this article. Now as we discussed in the previous blog of Earthquake vs Energy Dissipation we talked about how elastic deformations of material result in very low energy dissipation while the inelastic zone of the stress strain curve helps in much more dissipation of energy. Inelasticity results in very high strains and so it is important that the member is ductile, why? 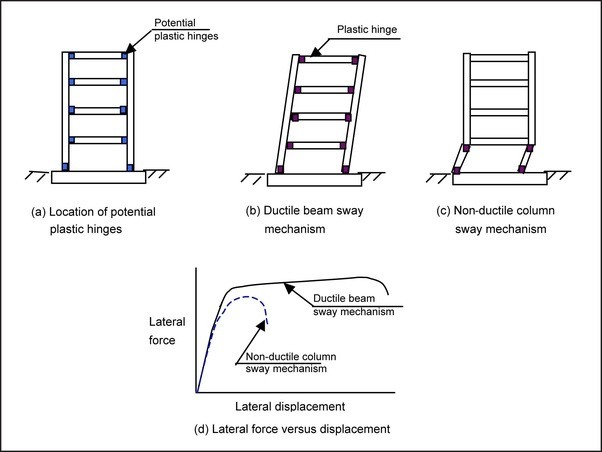 Because ductility is the ability of the material to go under large strains means a material that is more ductile can go into inelastic zones and can dissipate a lot of energy. This means that a glass or plain concrete can shatter easily in an earthquake when loaded while steel can stretch itself and keep you safe. Now how to make sure that we are achieving sufficient ductility for the structure? How do we make sure that the structure has enough reserves that it will not collapse? So here is the answer, the ductility of the structure is hidden inside its detailing. A well detailed structure will lead to a better performance under earthquakes as compared to a poorly detailed one. Structures are generally made of 2 primary materials concrete and steel. Now we all know that steel is a very ductile material, but concrete? Oh man, concrete is terrible in terms of ductility, it has hardly any tension capacity and it gets crushed in compression. So what to do? We make concrete structures ductile by adding sufficient steel into concrete members, we make steel structures more ductile by making connection stronger than the member itself. We make a structure more ductile by making columns stronger than beams so that columns remain elastic in case of earthquakes. So it is not just one region where you focus on ductile detailing, but in fact it is present in a well designed and laid out structures. Let us pick one point at a time. Let us go back to the structural mechanics class. We always learnt how shear demand is proportional to the pure moment demand acting in the beam. If moment demand is more, then it directly implied high shear demands. In case of moment frame beams or coupling beams (What is Coupling beam?) in shear walls, we make sure that the shear strength of beam is greater than the moment capacity of the member. How can we do that? Well, you put in reinforcement in the beam which gives you the positive and negative moment capacities of the beam. In case of lateral force resisting members, generally the positive and negative moment capacity of the beam is the same. Why is that? Because earthquake shakes the building back and forth and at one point if end 1 of the beam is experiencing positive moments then at the other instant it will experience negative moments when earthquake changes its direction of shaking. Refer to the video of test performed in a laboratory. What is a framed structure? We consider beams and columns fixity of different types. But we make sure that the system does not become a mechanism and looses its stability. We make sure that there no significant plastic hinge formations or else structure will lose its stability and on a pushover curve the structure will lest with negligible stiffness and stability. So that it resists the moments and shear forces acting in the building. Now earthquake also demands ductility, so we want the beams to go into nonlinear zone and rotate back and forth so that it can dissipate significant amount energy. So we want a ductile beam sway mechanism. 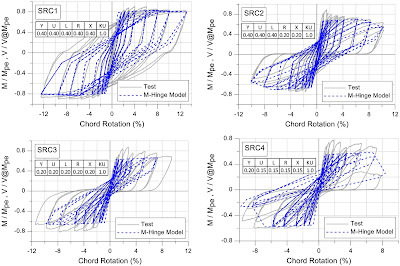 In the above image it is shown in figure (b). Now let us talk about a concept first. Take two scales, one made of wood and other made of plastic. Try bending both the scales and see which one is easier to bend? Of course the thin plastic one. After that, put both the scales on top of one another and try bending them together. Feel this, do you even feel the presence of plastic scale while bending? Of course not, because it is so much more flexible and weaker than the wooden scale. 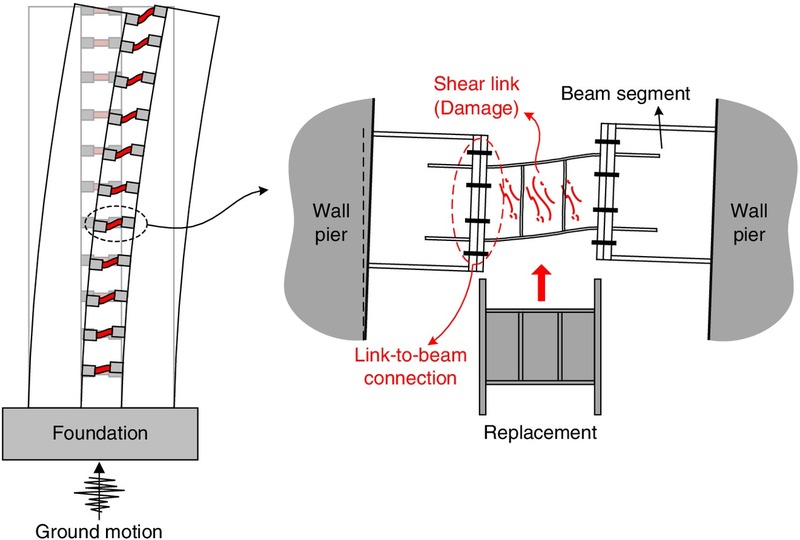 Similarly, if we want to make sure that we get ductile sway mechanism, we have to make sure that column is not only stronger than beam in terms of moment of inertia, but also the joint of the beam and column is stronger than beam itself. This will give more stability to the structure. A non ductile column sway mechanism creates moment hinges in the column and because the column is also loaded with gravity axial loads, it reduces the ductility and softens the building even further. This also creates permanent deformations in the building just like it is present in the picture. Also you can see that non of the beams have formed plastic hinges. Instead all the columns have these plastic hinges at the top and bottom of the structure. Now this significantly reduces the capacity of the building and if you plot a pushover curve of such structure it would look something like image (d) in the picture above. There is no ductility in the system which is really bad for earthquake resistance. Think about earthquake as a constant flow of water into your mouth. If you are not able to drink the water at the same rater as it is entering into your mouth, then you will spill it and also will create a mess. Earthquake acts as the same way. It constantly pumps energy into the system and if the system is not able to dissipate the energy then it collapses. We know that during lateral forces and because of interstory drifts columns experience maximum moments at the top and bottom of the story. Now we cannot lap the bars into the joint as those are the locations of maximum stresses. So the best possible location is around 5 ft from story height. This way, when the floor below is constructed the workers can easily stand on the floor and work on the column without worrying about the formwork and heights. Thus the construction process is accelerated. There is one more reason of providing closely spaced ties in the end zones of columns. It is because of these splices the strength of the section gets slightly reduced and the ductility is also reduced. So to increase ductility and column confinement we have to provide smaller spacing of ties. In case of Moment frames reinforcement should be spliced at the middle height of the column as moment frame is LFRS system and it will experience very high moments. So the splicing is particularly shifted to middle height in moment frames. No matter how high is the story height it should be in the center of the column as it is a region of zero moment. 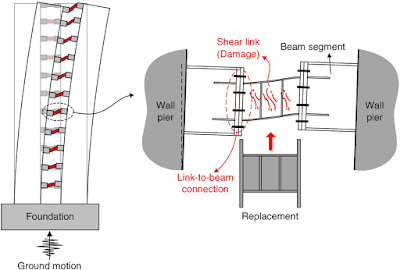 Whenever shear wall experiences heavy moments, its extreme ends go under heavy compression as well as tension. In order to make sure that concrete remains confined and bars do not buckle, we provide closely spaced ties within a certain depth of the wall. As we provide closely spaced ties, we eliminate the risk of reinforcement buckling as well as keeping the concrete confined. Thus the ductility of shear wall is achieved. I hope this was a healthy discussion related to ductility in building. This was again just an introduction. In order to completely understand structural behavior, it is important to understand elastic and inelastic behavior of structures, softening of a structure, nonlinear analysis, cracking of concrete. Make sure you read enough books after reading this introduction so that you can relate to our explanation. 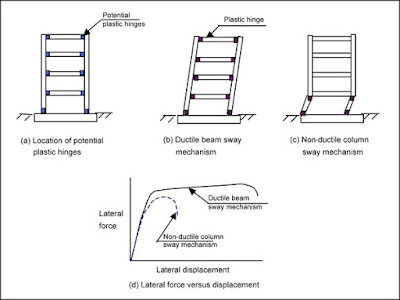 Our next blog will be ductility factor for different buildings. This factor is also known as response reduction factor for seismic analysis of structures. Have a nice day. Thank you for reading this post. Hello Sir I recently came across your YouTube channel. The quality of the lectures is really impressive. To dig deeper into the information, I also found your website and the blogs are really informative and precise and makes one even think more about these intricate structures. Hands down one of the best videos I have seen on YouTube related to structures. They are so close to practical life. Iam a senior Year undergraduate Student studying Civil Engineering in Istanbul. I would like to ask more about structures and some future prospects about this field.